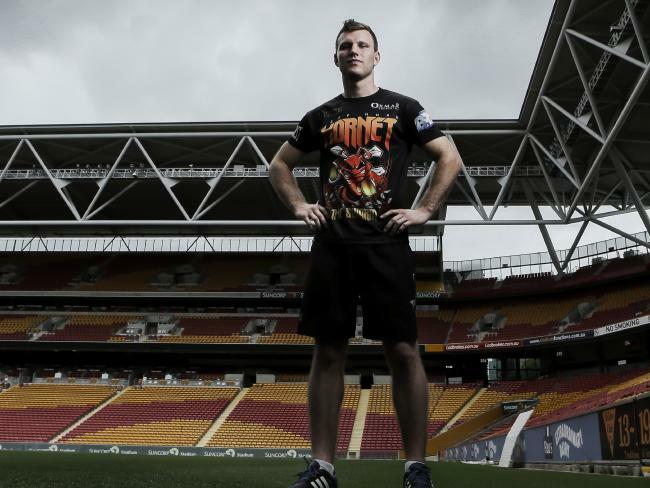 JEFF Horn casts his eye around the vast cauldron of Brisbane’s Suncorp Stadium and imagines 50,000 people watching him beat world champ Manny Pacquiao on April 23 in the biggest fight ever staged in Australia. Jeff Horn believes he can cause one of boxing’s greatest upsets should Manny Pacquiao agree to fight him at Suncorp Stadium. Picture: Mark Cranitch. Horn’s promoter will be in Los Angeles on Tuesday trying to sign a contract to bring the Filipino boxing icon to Brisbane for the biggest fight ever staged in this country and Horn can see himself overwhelming Pacquiao in one of the great upsets in boxing history. Two problems. One: Pacquiao is still a formidable force who will take some beating and two: Brisbane has to find the money to pay for the world welterweight champ’s multimillion-dollar purse. Pacquiao, now a leading Filipino politician, wanted $20 million to face American Terence Crawford in April but will likely demand less for Horn, who despite being the No.2 contender for Pacquiao’s WBO world welterweight title is relatively unknown outside diehard boxing fans.